Everybody is fond of shopping, until you get to the checkout and need to swipe your credit card. This is not particularly the most exciting part of shopping. And when you add in an annoying user experience of payment forms, it may lead to a failed conversion. The significance of a good credit card payment form is substantial. A whole process leads to this very last step and losing the user before payment is definitely not an option. There are times when a single form field can play a big role. This is why it is important that you test and analyze the usability of the checkout form on a periodic basis. There are plenty of payment options like PayPal, one of the popular payment gateways; but these payment gateways have their own fixed designs that can hardly ever be changed. By choosing payments via PayPal option, users are redirected to PayPal, where they need to fill the form, pay and are then redirected back to the website. This is not really a good experience and so, having your own credit card payment form becomes a necessity. Keeping designing in your own hand lets you control the design process as well as the overall experience. You need to prove your website is secure and trustworthy and this is perhaps one of the biggest challenges. You need to make the whole process usable for your user, else it won’t make any sense. 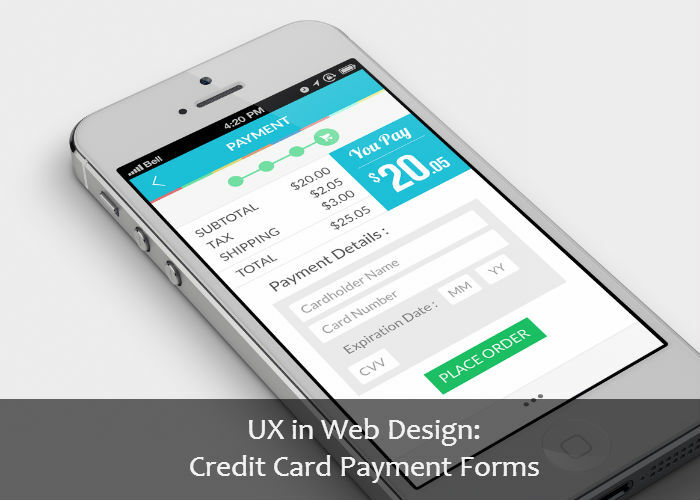 There are a number of things you need to take in consideration while designing credit card payment forms for maximum usability. At times, user testing and talking to your customers can help understand some of the main issues that may be holding them back from completing the transaction. Let’s take a look at some of the main factors involved. You need to analyze and establish the minimal amount of information you really require to process a payment. Anything extra should be eliminated. The less information you will demand the less likely the user will make a mistake, the less time he/she will take to complete the form and above all, you will have happier customers in the end. For instance, some online payment forms ask for the cardholder’s name, while others do not. Usually, name is not required to process a payment. So, if you can eliminate this field in your form, do it right away. Also, spend some time to check the local regulations and requirements for online payment to make sure that your form is not just usable but legal too. UX is all about making it simpler, smoother and faster for the customer. Try to reduce the number of steps involved in the credit card payment process to the minimum. For example, the “credit card type” field is actually an unnecessary field given in most of the payment forms on websites. The first digit of the card number is enough to identify the type of the card. So, this field can be readily omitted. The credit card payment form is indeed the most important part of a checkout form. Here, customers are comparatively more focused and try not to miss any hint of insecurity. So, you need to reduce clutter from this page and try to make it as straightforward and transparent as possible. Highlighting important details, such as “1 month FREE trial” and “100% Moneyback guarantee” is quite beneficial. Thinking that data labels are sufficient to design a comprehensible web form is a myth. Labels are necessary, but they are not at all sufficient. A short and simple instruction attached to the field can help in error prevention and building great user experiences. So, don’t be afraid to sound too obvious! You need to install all the necessary security certificates to make it safe to collect and store credit card information on your website and to make sure that no data is used for malicious purposes. This is essential to gain user’s trust. After you have taken all the security measures, point it out to the customer and make him/her feel safe on your website. Web form usability is crucial to the conversion process, but is also one of the most vulnerable parts of a website. If not designed properly, it can easily lead to frustrated customers; so you should never stop improving your web forms.